Favorite food: "see" food!! treats and mom & dad's salad. Favorite toy: Soft plush toys: carrot, bunny, crab, turtle, bone. Favorite activity: Going in and out the doggie door. Proves my independence! Patrol the yard to make sure that the birds don't take over my territory. Special talents: Dance on hind legs, roll overs. Giving that la la look to dad! Most embarrassing moment: None, who us.... we are terriers! Most trouble I ever got into: Chewed mom's brand new polar socks! My favorite friends: The real cats, Kimmie and Prints! 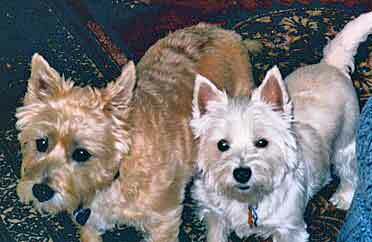 Biggest adventure: When my cairn brother fell in the ditch chasing the wild chickens! .